Bokor Mountain Lodge is solid central choice, though perhaps a littler shabbier than we’d like. 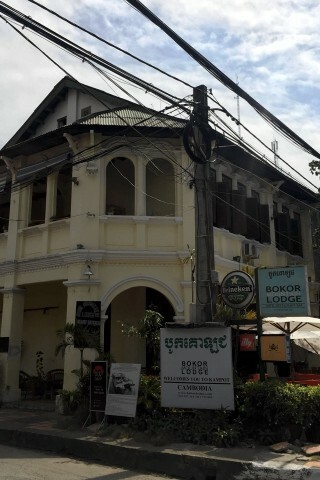 The lodge has changed hands and opened and closed a couple of times over the years, and currently the FCC group owns the place, which is not to say that it is up to the same standards as you’ll find at the FCC in Phnom Penh. Rooms come either with or without river views, while all are air-con and come with cable TV, hot water bathrooms, ceiling fans and breakfast. The front rooms have bathrooms with bathtubs, and a pleasant second-floor veranda overlooks the river. The lovely colonial building kind of, almost lets them get away with the fairly shabby furnishings. It almost feels romantic — in that artist’s garret kind of way — though at these prices, we’re not sure how long the romance would last. It is, though, an excellent location, and the bar and restaurant downstairs are a treat with friendly staff and a wide-ranging menu. This place would be a stormer with a bit more TLC. That said, by Kampotian standards this is a reasonable midrange choice. Even if you’re not staying here, it’s worth dropping by come the late afternoon for a sundowner. They have live music here too some evenings. Check rates at Bokor Mountain Lodge on Booking.com.